5 What are the Best Binoculars with Camera? Binoculars with cameras have come a long way in recent years! What used to be a great idea with an unfortunate lack of results is now a functional product that produces quality still photos and even video with sound. In these binoculars with camera reviews, we'll take an in-depth look at the best binoculars with camera available. We'll analyze features and performance to help you find the best camera binoculars for your needs -whether you want to take them out to the plains to snag some pictures of the pronghorn herds or to the next home game to capture that winning touchdown forever. Our top pick is the Sony Digital Recording Binoculars. Keep reading to see if you agree. The Sony DEV50V/B Digital Recording Binoculars are one of the best binoculars with digital camera available on the market thanks to quality optics paired with Sony's trademark electronics. These binoculars have a magnification range of 0.8x to 25x with a state of the art high contrast organic light-emitting diode (OLED) finder that provides sharp, detailed images even in low light conditions. OLED is the very latest in technologyused in screens for mobile devices. It's thinner, lighter, and works without a backlight, contributing to an overall lighter weight, longer battery life, and higher contrast images. Unlike most binoculars with cameras, these truly combine the binoculars with the camera so that what you see through the binoculars is what you are actually taking a picture of -and at the same magnification. They feature an Optical Steady Shot image stabilization as well as an "active" mode that help to provide photos and video that are clear, with stable and non-blurry images -even when the subject is moving. There is also a Hyper Gain function which optimizes the light gathering ability and allows you to take great pictures even in low light conditions. One of the most impressive features, however, is the by pixel super resolution that provides sharp images and allows for these camera binoculars to take double full HD and 3D video. That's right: you can film your own 3D video with these binoculars with camera. And thanks to the included HDMI cable, you can plug thesm directly into your HDTV and relive the action. These binoculars are also dustproof, waterproof, and able to be used outside in the rain. They measure 8.4 inches by 7.5 inches by 10.5 inches and weigh just 3 pounds. In addition to the HDMI cable, this kit includes a charging pack, full-sized 64GB SD card, micro-fiber cleaning cloth, and a lens cleaning kit. See price and more of these Sony Digital Recording Binoculars... Click here. These binoculars with camera have a 12x magnification range making them truly functional for hunting, birding, or using at your team's next home game. The 32mm objective lens isn't huge, but it's still large enough to let in plenty of light to get a clear view of what you're looking at. They have a close focus of 8 meters, but it's important to remember that the optics of the binoculars and camera are separate (as with most binoculars with camera hybrids.) What this means is that if you're looking at something closer to you than a hundred feet, what you see and what the camera sees will not be the same thing. However, this camera-binocular hybrid still takes high-quality HD photos and video. These binoculars have a two inch LCD screen and a tripod adapter to help you take steady photos and videos -useful when birding or identifying your target and taking a "first shot" before getting the money shot with your professional quality camera. It comes with a 32GB SD card and a USB cord to allow you to easily connect the binoculars to your computer or HDTV; this cord is also used for charging the camera binoculars. They also include a lens cloth and complete instructions on how to use. They measure 7.48 inches by 3.15 inches by 5.51 inches and weigh just under a pound. 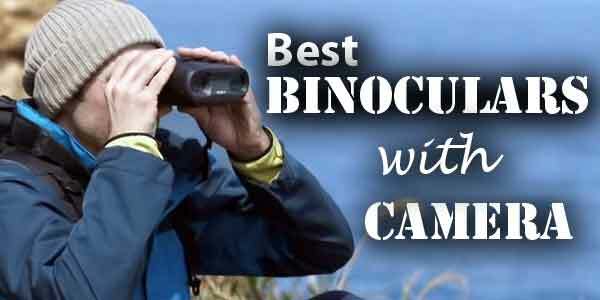 The Bushnell ImageView Binoculars with Camera made our list of best binoculars with built-in camera thanks to Bushnell's top quality binocular optics. These have a magnification of 10x with an objective lens size of 25mm, making them comparable to a pair of high-quality compact binoculars. Folding roof prisms deliver crisp images while helping to keep this binocular with camera lightweight. 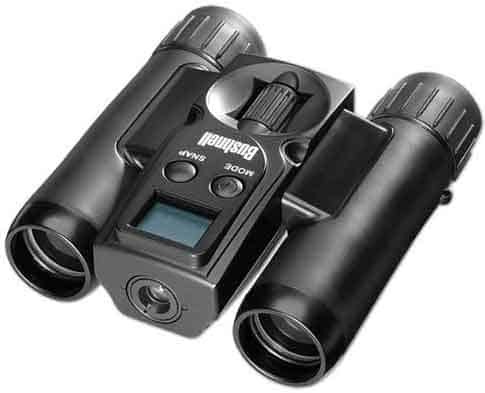 The binoculars and camera do have separate optics, which is to be expected of any binocular camera hybrid in this price range. For this reason, it's important to remember magnification is also separate. However, the camera does have a magnification range of up to 8x, allowing you to take photos at a distance. 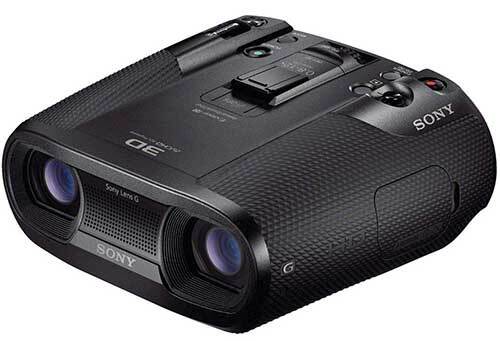 While this camera-binocular hybrid is unable to take video, it does enable you to take great VGA still photos. These binoculars have a tripod socket that allows you to get stable shots out in the field and to check on the local herds. They come with a 32 GB SD card, a remote shutter cable, USB cord for easy transference of photos to your computer, a neck strap, lens cleaning kit, and a battery-powered charger. They measure 2.3 inches by 7 inches by 7.8 inches and weigh less than a pound. This makes these binoculars with camera one of the smallest and most lightweight pairs you can find. 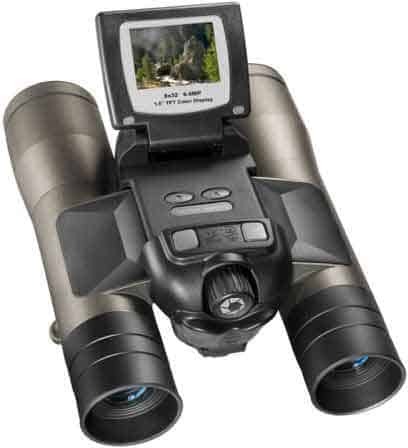 These Barska Point n' View Binoculars with a Camera are made by one of the leading names in hunting optics. They have a magnification of 8x and objective lens size of 32mm. This makes them comparable to a high-quality pair of compact hunting binoculars. They feature multi-coated optics and roof prism to provide sharp images with excellent clarity. The Point n' View has a close focus of 16.4 feet and a field of view (FOV) of 330 feet at 100 yards. The binoculars and camera do have separate optics and magnification, which is important to keep in mind when prepping for a shot. It's also important to remember that combined optics and zoom are available in very few camera binoculars and that this doesn't make this hybrid product without its use and benefits. The camera's 4x magnification lends plenty of functionality to these binoculars and makes them excellent for use when birding, hunting in the scrub brush of the Midwestern marshes, or at a sporting event. The camera also has a built-in automatic CMOS image sensor that helps with image quality when the light conditions fluctuate. The 1.5-inch flip-up TFT display screen lets you easily review your pictures and frame your shot. Easy to use function buttons let you quickly change settings and modes. It comes with a USB cable to transfer pictures to your computer and editing software to tweak your photos to perfection. It is SD card compatible, but it does not include one. It also comes with a carrying case, lens cleaning cloth, and one year warranty. They measure 6.1 inches by 4.5 inches by 2.4 inches and weigh less than one pound. 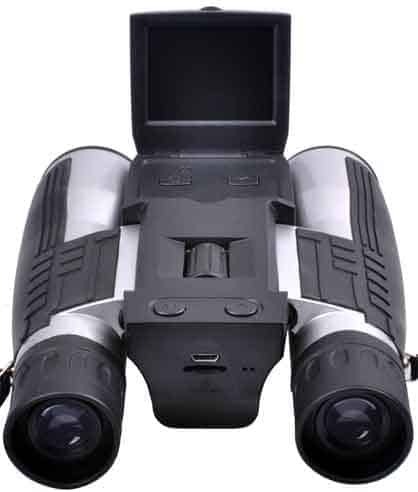 Check out this Barska Point 'n View Binoculars here. What are the Best Binoculars with Camera? If you're looking for the best binoculars with camera, we're sure that this camera binoculars review will help you to find what you're looking for. Our favorite was easily the Sony Digital Recording Binoculars Kit. This is a top of the line binocular with camera that can take high quality still photos, HD video, and even 3D video. It has the most versatility and functionality of all the camera binoculars we looked at. They have a high magnification range with combined optics that ensure that what the camera sees is the same as what you see. And this makes for easy zooming as you won't have to fiddle with the focus twice. However, the price does make these binoculars with camera a non-option for the budget minded but does explain the discrepancy in features between these camera-binocular hybrids and some of the most affordable models.